If only I smiled like Zeddie. I wish I was as photogenic in my race photos as Zeddie Little is in his. Zeddie looks happy, and effortless. I'm pretty sure those people in the background are judging me. I look tired, and miserable. Also equipped with freaky legs. As a note to myself – always look for photographers in races. And have a freakin’ smile on your face!!! Do you know Zeddie? Or did you just look for someone who had a good photo! When we run together in June I will point out the photographers to you so that we can be sure to smile and pose! This post brightened my day a little…just because it’s so funny and you! You look great!! Like you’re getting ready to accomplish a great time in the Rock the Parkway Half Marathon. Zeddie probably ran a 3 hour half (leisurely jog). He may have stopped along the way for a Starbucks Mocha and a cookie. He also probably got a promotion and a HUGE raise the day before. No wonder he’s smiling! Haha, love this. 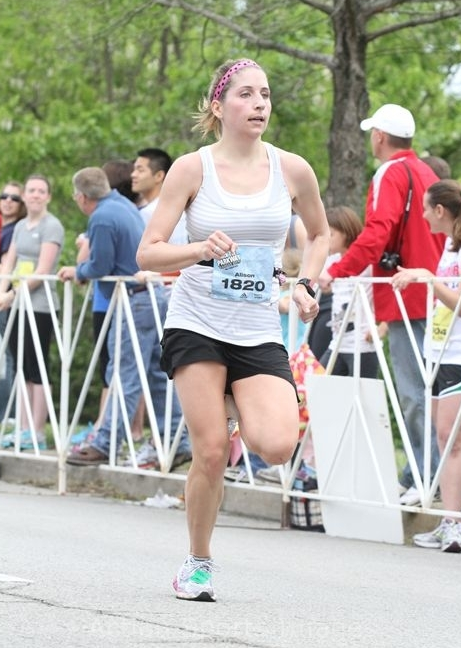 I checked out my photos from the race and even though I knew the camera was there, I still look a little like a weirdo 🙂 I always looks like I’m lesisurely walking, so my boyfriend told me to really pump my arms to make me look faster and then it just turned into a joke whenever I saw a camera. Definitely nothing like Zeddie. And my legs look super weird. But they’re funny to look through! he IS incredibly good looking. LOL!